Exploring Beaver County – Beaver Falls, Pa. Stray Cat Studio – A major player in the Beaver Falls renaissance. For the second stop in my Exploring Beaver County blog series, I hopped on my bike and pedaled my way over the Beaver River, twice, to the City of Beaver Falls. When I was a kid, this burg was booming. Whenever my sisters and I needed new shoes or a winter coat, we’d pack into my parents’ International Scout, swing by Bridgewater to pick up my grandparents, and head over to Beaver Falls, which seemed like it had around a dozen shoe stores and I don’t know how many independent clothiers. Of course, we’d always stop off at Eat’n Park first for a “bear claw”. 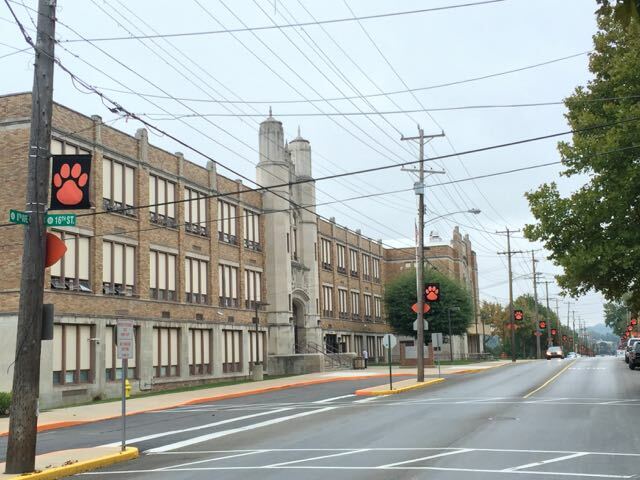 Unfortunately, like many other Beaver County communities, Beaver Falls was hit hard by the one-two punch of the steel industry’s decline and the rise of the shopping-mall era during the 1970s. Today only a couple shoe stores remain, and Eat’n Park…well, it’s just a sweet memory. That said, exciting things are happening in this city – a city that gave us Broadway Joe, the first-ever college basketball game (1893), and, last but not least, the setting for TV’s Mr. Belvedere! Crossing over the Beaver River from New Brighton to Beaver Falls, I couldn’t help but think of the old McDonalds – the kind with the big yellow arches on each side of the building – that was razed when the new bridge was built. Too bad. (Anyone else remember that?) Then, as I passed the big brick home of Keystone Profiles Ltd. on my right, I thought to myself, It’s nice to see manufacturing still taking place here in the county. I also thought, What the heck are “precision cold drawn products”? Just ahead on the left, you’ll find Stray Cat Studio, one of the coolest spots in the new Beaver Falls. When you first walk inside Stray Cat, you can’t help but be blown away by their impressive Artisan Gift Shop, which features handmade art and gifts from more than artists, all from Western PA. On the other side of the shop you’ll find their Pottery Studio, which features five potter’s wheels and is open to professionals and students alike. Here they host pottery classes and even pottery parties for people interested in the craft or just looking for a fun night out with friends. Stray Cat is also a stop on the Autumn Splendor Arts Tour, a month-long celebration of art and creativity that takes place in October throughout Beaver and Lawrence counties. Shifting down – way down – I huffed and puffed my way up Seventh Avenue hill to one of my favorite antique stores in the region – This & That Downtown. Formerly located up on College Hill at the other end of town, This & That moved downtown a few years ago and has really done a great job of stocking their store with tons of unique treasures for treasure hunters like yours truly. A couple years ago I stumbled upon a mint condition, circa 1950s Smith-Corona Clipper typewriter here. Score! If you can’t find something cool at This & That, don’t worry. Just across the street you’ll find The Antique Emporium, an antique store on steroids, with three floors and over 100,000 items in stock. 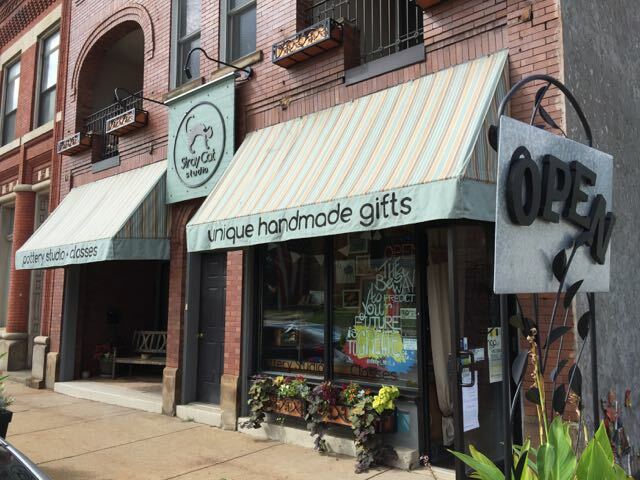 And, just a few blocks up Seventh Avenue, Vintage Reborn is where you can find a whole store full of repurposed vintage and antique items. I love that Beaver Falls has some of the coolest antique and vintage places around. These are the kinds of towns my wife and I look for when we’re on the road, and I know we’re not the only ones. Thanks to shows like American Pickers and Pawn Stars, there’s a whole new subculture of modern-day treasure hunters who travel the U.S. looking for towns just like this. Continuing down Beaver Falls’ main drag, I passed by even more positive signs of growth and change, like Hutch & Home, Beaver Brewing Company, Song-Thai, and Chong’s Korean Cuisine. Of course, I was also tempted – very tempted – to stop at the Beaver Falls landmark, Oram’s Old Fashioned Donuts, for one of their legendary cinnamon rolls. But I couldn’t figure out how I would hold the monstrous pastry and steer my bike at the same time. After a breathtaking – literally, I couldn’t breathe – climb up College Hill, I passed by my dad’s alma mater, Geneva College, before rewarding myself with a rest and a killer cup of joe from Beaver Falls Coffee & Tea Company. If I had to choose one word to best describe Beaver Falls, it would be POTENTIAL! There are so many young people out there today who want all the culture and convenience that comes with urban living. They want fixer-upper housing with lots of old-fashioned charm and character. They want walkable communities, cool vintage shops, and diverse eateries and cafes. This is what you’ll find in Beaver Falls. It just takes a few seeds for the growth to take hold, and then it will spread from one storefront to storefront, from one home to the next. Luckily for us, the seeds have already been sown. I can’t wait to see what the future holds for this proud and historic Beaver County town! Stray Cat Studio – Stop in. You won’t believe your eyes! This & That Downtown – I found Fleetwood Mac’s Rumors in vinyl…for $1 buck! Antiques Emporium – Prepare to have your antique-lovin’ mind blown. Hutch & Home – Home decor and design specialists. Beaver Falls Coffee & Tea Company – One of the hippest cafes around. Great coffee, too. Oram’s – You know you want to. Carnegie Free Library of Beaver Falls – Every community should have such a resource. Beaver Brewing Company – It’s beer. DUH! 29 Responses to "Exploring Beaver County – Beaver Falls, Pa."
Great article having grown up in BF and witnessing its downfall and now rebirth. Yet, I was disappointed that you didn’t give a shout out to two retail establishments that chose to remain on Main Street rather than move to Chippewa or a local mall: Enlow Shoes and Wolves (especially since you started by mentioning shoe shopping at the beginning of your article). I was also sorry that you didn’t mention the Beaver County Humane Society’s Thrift Store in the former KELLY Hardware Store building at 1900 7th Avenue along with your plug for the other thrift and antique shops. Another great place to find great stuff plus it supports a worthy charity in our community, which is a cool thing about it. I am so glad to see that Beaver Falls is coming back in such a positive way. It was a great place to grow up and though I don’t get back there often my daughter lives and works in Beaver County and is witnessing the changes. Thanks for your comment, Melissa! Yes, exciting things are in the works. But the community has to get actively involved and support the downtown businesses in order for the momentum to keep going. Let’s hope they do! Great article. I love that you do the hard work (pedaling) for us and help promote the county. Growing up in Beaver County I love these blog posts!! We also shopped in Beaver Falls for shoes and school clothes!! Enelow’s was a favorite as was the Youth Center. There was also a JC Penney’s. Wolfe’s seemed to be for the grown ups although I surely remember it. Pinchak Shoes was my mom’s go-to for us …. it has been long gone. Joe’s Cafe was our Friday night dinner out until they closed and then we shifted to Didio’s in Rochester – a place I sorely miss. Thank you for the memories as well as being sure we’ve been introduced to all that still exists or is growing in our county. Great posts!! Beaver Falls is coming back? That’s a great sign. Still in the early stages, Frances. But good things are in the works. It’s all up to the people of Beaver Falls and the surrounding communities as to whether or not the positive growth continues. Thanks for reading! Val, The Chicken Shack next to the library is one of my favorite go to lunch options when visiting Beaver Falls…but it’s clear my culinary taste tends to be a bit traditional. This is one of my favorite pieces, Val! Nice work! Loved your blog-I am a librarian at the CFLBF (Carnegie Free library Beaver Falls)-we are very proud of our library-the first in beaver county. Can’t wait to meet you at author’s night! Thank you so much for mentioning Vintage Reborn! We have entered our third year in business.in addition to all of our up-cycled merchandise, we offer ladies paint nights and more. Thanks so much for seeing our great city and mentioning Vintage Reborn! We are now entering our third year of business. In addition to our merchandise, we also offer ladies paint nights. Visit our Facebook page, Vintage Reborn. We love your vision! Potential is Beaver Falls! I grew up in Beaver Falls. Left there in 1985. Sad how it has gone down hill over the years. Would really love to see it like it was. Shopping , walking in town , going to the library . I love this article! Just the kind of upbeat piece we need. Thank you for your vision, Val! See you on the 22nd. Great article as usual. I lived in Beaver Falls at one time on 19th Street. I walked to Islay’s many times for ice cream when my daughter was little. We put on many miles and I still do as my mom lives in BF so I do go to Athens, Chicken Shack, Oram’s ( and I wonder why I am fat- all food places) and I belong to the First Presbyterian Church. Allot of good is happening in town and Stray Cat is owned by an awesome Christian woman. Best wishes to all. Thanks Val. Happy trails. Despite the general decline of the area I bought a victorian home 2 yrs ago here in beaver falls and couldn’t be happier. My realtor said if the home was located in a more upscale area it would have been priced 3-4 times what i paid for it. Your article is inspiring to me and i’m sure many others who would like to see beaver falls make a comeback. Do you know of any committees that one could join to help the cause? Hi Valerie! You can certainly join our Community Development Corporation for one. We have several projects underway. Message me on Facebook if you are interested in hearing more! Feel free to reach out to me at the City Building and we can talk through some things in the works as well! bwilliams@beaverfallspa.org or (724) 847-2808 x201. So glad to hear of your energy! Temptations by Donna Lee . I remember shopping there when I was in high school for a special occasion dress. The atmosphere felt so upscale to a small town girl, such elegant clothing. When I was in my 20’s, I purchased a coat from her, it cost $120, in the 70’s that was pricey, well worth it, I still have it. I policed in Beaver Falls for years and have now retired to Nokomis, Fl. But Beaver Falls and its residents are very special to me. The City can come back and has a great start. I think the problem going forward is that Beaver Falls itself has a 67% renter occupancy rate (meaning 67% of the people who live there rent). That’s a huge number, and it means transience … and fewer people invested personally in the area where they live. On the upside, though, is that we (as landlords) have found that working with all aspects of the city’s authorities (police, city employees, the rental office, various organizations that help low-income renters) have all been amazing to deal with. Everyone is helpful, kind, clear, and personable. We’re slowly fixing up our own rental properties (some we bought were in bad shape), and it’s been a delight to have a community of people who make the process painless. Who knew governments could run so smoothly? This gives me hope for the whole area. Wow, one one hand it’s not surprising (the high renter rate), but on the other hand, wow. I wonder what it would take to change that. Great post, Val. I think I’ll make my reading class at Geneva check it out 😉 And now I’m hungry for Oram’s. Dangit…. Wow, thank u so much Valentine for taking the time to inform us all how good ole b.f. is coming back to life. I grew up on College Hill, near Heinrich memorial pool(best memories ever!) in the 60’s & 70’s. B.F. was an awesome place to live then. Those were the days when u could leave ur house unlocked (even at night) and u actually know all the people in ur neighborhoods. I attended school there all my life. I went to 37th st, 38th st., the old middle school, and was the last class to graduate in the old high school in 1978. By the way we had the best class ever!) I used to walk downtown and frequented hoffman’s (vanilla coke’s), Isaly’s(best ice cream around), Orams(what can i say? ), Morell’s drug store, D & K, 5 & 10(with gma, she lived right behind there), Enelow’s, Antique Emporium, Athen’s (best gyro omelet ever), Burger King, The library, the youth center(school clothes), and I’m sure there are a few more I can’t recall. I Havn’t lived in B.F. since I was 17, but my parent’s and friends are still there. I saw how the area crashed with the steel mill decline(saddest time for so many) and how drugs, prostitution, killings, thefts, etc. took over. It makes me so happy to see B.F. is coming back again. I will definitly start visiting there more often again. I as well hope and pray the ppl of B.F. continue what they are doing and more ppl realize the potential there and start buying properties again. I believe it will once again thrive! I want to thank you for all that u do. It means a lot to me. Rock on B.F. Tigers!!! Thanks for taking the time to comment and for reading my post, Cheryl!